This kit of special tools and hardware will let you do this critical doctors exam yourself. And you will save lots of $$$ - maybe even tons. This exam would cost you $300 to $400 at a shop. You will also save $40 over buying these items individually, and you could save thousands when this kit prevents you from purchasing the wrong car! The horror stories we hear regularly about bad diesel purchases are preventable. The exam kit contains the following: Click on each link in the related products to read the full description or to purchase the item individually. Valve Adjusting wrench set with feeler gauges and detailed instructions. Note: A proper valve adjustment MUST be done before a compression test in order to assure accurate results. Diesel Engine Compression Tester with detailed instructions. 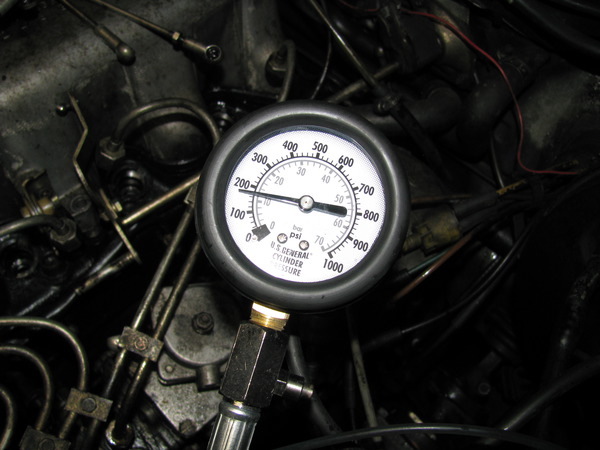 A cranking compression test is the key to determining the internal physical health of the engine. And the engine is the most important and most valuable asset of the car. 60 inches of injector return hose and 4 heat shield crush washers. The fuel injectors need to be removed when doing a compression test. Replacement of the injectors will require replacement of the sealing washers under the injectors and the rubber injector fuel return hose. Fuel Injector Socket. A must have in order to easily remove the fuel injectors for testing. Advanced Fault Diagnostic Manual for Diesel Engines. This pictorial manual will walk you through diagnosing all engine staring problems, shut off problems, performance problems, noise problems and fluid leak problems. A must have for every 220D 240D diesel owner. As an extra bonus we will include a new 4 cylinder valve cover gasket FREE OF CHARGE. The valve cover gasket should be changed every time the valve cover is removed to prevent leaks. If you already have one or more of the above items just order the others individually to complete your exam kit. We are happy to send this item to Canada or International Customers via US Priority Air Mail Flat Rate for huge savings. Doing a compression check on a 61x diesel is not difficult if you have the right equipment! Always check engine compression BEFORE purchasing an older Mercedes diesel!